Congratulations to Traci Sorell for Orbis Pictus Honor Award! 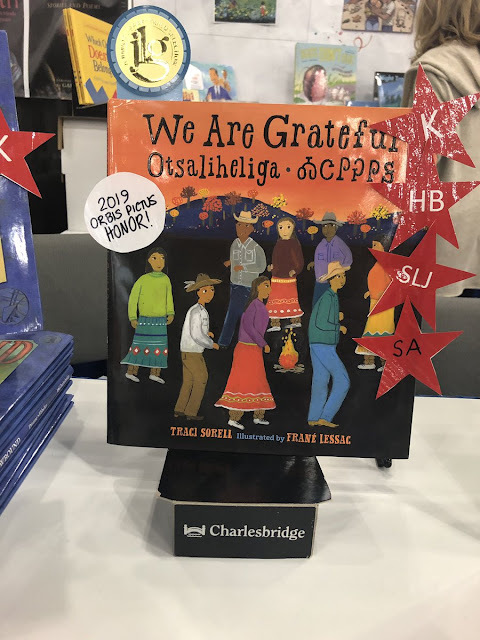 Some terrific news today (November 17), from the 2018 conference of the National Council of Teachers of English! 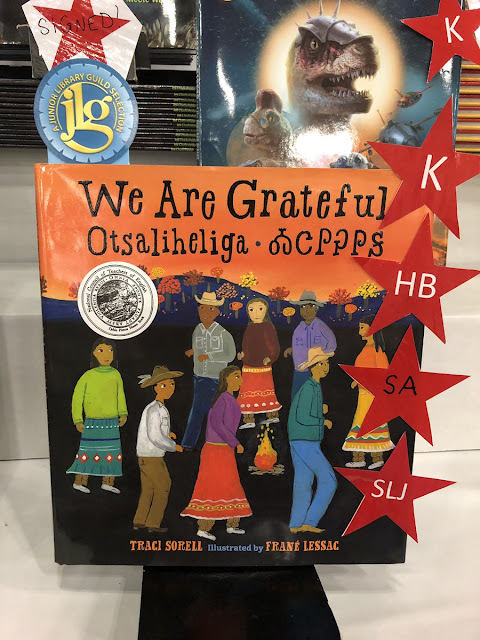 was selected for NCTE's 2018 Orbis Pictus Honor Award! See those stars on the right? Those indicate starred reviews from the review journals: Kirkus, Horn Book, School Library Journal, and Shelf Awareness. 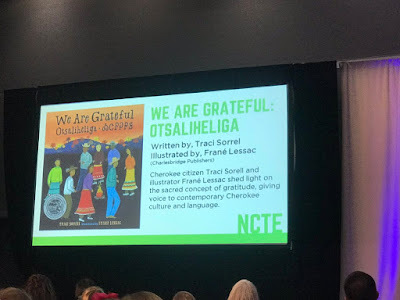 NCTE's award is for nonfiction. Congratulations, Traci! This is wonderful news! Some time back, I learned that Daniel José Older was working on a series that would blend history and fantasy. The first book in the series--Dactyl Hill Squad--is out and I gotta say, I enjoyed it! Older, by the way, is not Native. This is the second time I'm recommending one of his books. He's a terrific writer. There were several terrific passages in his Shadowshaper. It's 1863 and dinosaurs roam the streets of New York as the Civil War rages between raptor-mounted armies down South. Magdalys Roca and her friends from the Colored Orphan Asylum are on a field trip when the Draft Riots break out, and a number of their fellow orphans are kidnapped by an evil magistrate, Richard Riker. Magdalys and her friends flee to Brooklyn and settle in the Dactyl Hill neighborhood, where black and brown New Yorkers have set up an independent community--a safe haven from the threats of Manhattan. Together with the Vigilance Committee, they train to fly on dactylback, discover new friends and amazing dinosaurs, and plot to take down Riker. Can Magdalys and the squad rescue the rest of their friends before it's too late? But it was only a few years ago that New York had passed a law granting black citizens the right to dinoride, and white people in Manhattan still bristled and stared when they saw someone with brown skin astride those massive scaly backs. Magdalys and the other kids can't ride them, though. The orphanage staff didn't want her near them. So Magdalys mostly had to be content with watching the great beasts cavort along outside her window: The lamplighter’s iguanodons would pass first thing in the morning, extinguishing the lanterns as the day broke. Then the commuter brachys would stomp past, passengers cluttered on the saddles and hanging from straps along the side. By noon the streets would fill with stegosaurs lugging supplies and the duckbill riders in fancy dress clothes, heading off to important meetings, while microraptors scurried across the roads, carrying messages or making nuisances of themselves. Most of the trikes and raptors had been sent down south to fight the Confederates, but every once in a while she’d see one of those too. As I read those words, of these specific dinosaurs and what they did, I could see them, in my minds eye. Pretty cool world, Older is building! What the description doesn't tell us is that one of Magdalys's friends is a Native girl. Her name is Amaya. Her mother is Apache; her father is a White general. We get to know a little about her, in tiny bits as the story unfolds. When she was little, her father worked at a military school in South Carolina. There, he taught her military tactics and weapons. When the war broke out, her father took command of a Union regiment and left her at the Colored Orphan Asylum. The things her father taught her prove helpful as the squad works to rescue the kidnapped orphans from the slaver who intends to take them south. That's all we know about her when the Dactyl Hill Squad ends. I'm thinking about Amaya's back story. How did her mother and father meet? I'm curious and wonder what we'll learn in the next book in the series! 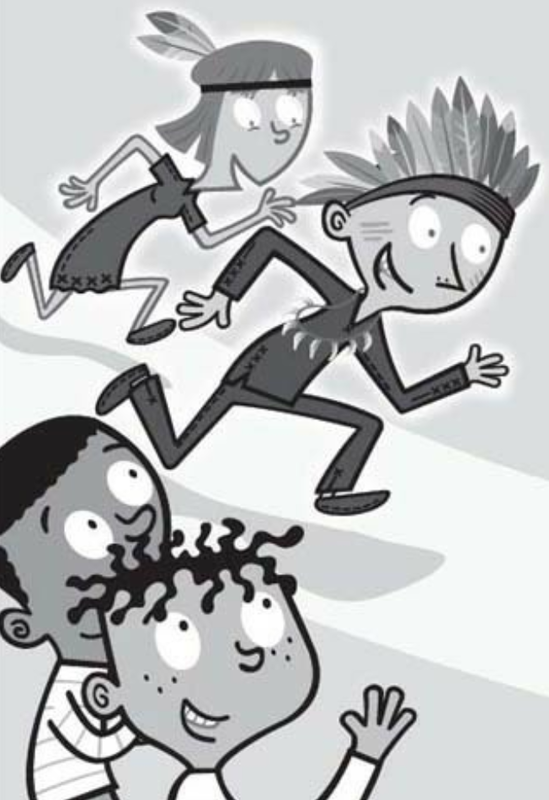 Given what I've seen so far, I think Native kids will like seeing her in this book. 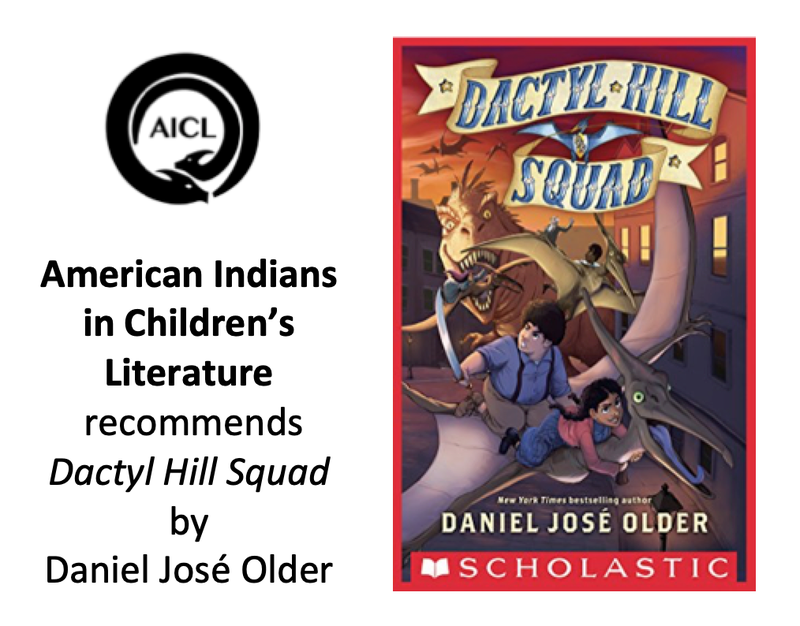 And so, I recommend Daniel José Older's Dactyl Hill Squad. And I know my little sister's grandson is gonna like this series. He wants to study dinosaurs. Debbie--have you seen THE RANSOM OF MERCY CARTER by Caroline Cooney? Deerfield, Massachusetts is one of the most remote, and therefore dangerous, settlements in the English colonies. In 1704 an Indian tribe attacks the town, and Mercy Carter becomes separated from the rest of her family, some of whom do not survive. Mercy and hundreds of other settlers are herded together and ordered by the Indians to start walking. The grueling journey — three hundred miles north to a Kahnawake Indian village in Canada — takes more than 40 days. At first Mercy's only hope is that the English government in Boston will send ransom for her and the other white settlers. But days turn into months and Mercy, who has become a Kahnawake daughter, thinks less and less of ransom, of Deerfield, and even of her "English" family. She slowly discovers that the "savages" have traditions and family life that soon become her own, and Mercy begins to wonder: If ransom comes, will she take it? Lois Lenski's Indian Captive: The Story of Mary Jemison, published in 1941. Like Cooney's book, it also won a Newbery Honor Medal. Elizabeth George Speare's Calico Captive, published in 1957, and based on the capture of James Johnson and his family in 1754. Dear Lord, prayed Mercy Carter, do not let us be murdered in our beds tonight. I'll see if I can get a copy of the book, but some things I see (like that first line) suggest that the book is a sensational telling--more of a thriller than anything else. The word "savage" appears in it 29 times. Skimming what I can see online, I see there's a scene where the captive kids watch a Native man who had "taken four scalps" earlier. The description of his actions is very detailed as he scrapes flesh away. Pretty gross, isn't it? So, I have a hunch that The Ransom of Mercy Carter will end up with a not recommended tag. Open Letter: "Trail of Lightning is an Appropriation of Diné Cultural Beliefs." Does the Letter from the Diné Writer's Collective Mark a Turning Point? On November 5, 2018, Indian Country Today published Trail of Lightning is an appropriation of Diné cultural beliefs. It is from the Diné Writer's Collective and is signed by Esther Belin, Sherwin Bitsui, Chee Brossy, Dr. Jennifer Denetdale, Tina Deschenie, Jacqueline Keeper, Dr. Lloyd Lee, Manny Loley, Jaclyn Roessel, Roanna Shebala, Jake Skeets, Dr. Laura Tohe, Luci Tapahonso, and Orlando White. All the people that signed the letter are Diné (Navajo). They write poetry, fiction and nonfiction. Some are professors or teach writing. As far as I know, this letter is the first of its kind. These writers are telling everyone not to appropriate Diné culture and beliefs. 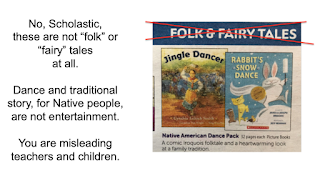 There are other examples of literary appropriation of our culture by non-Navajos. Notably Tony Hillerman and his "mystery" books that appropriated and continue to profit off Navajo culture and stories without shame — all while portraying us inaccurately. Once again, there was no Diné "board" or "intellectual property committee" that denounced Hillerman’s use of our property (in the 1970s-90s when he published the bulk of his books) for his gain and it has gone largely unchecked. We think of other non-Navajo writers such as Oliver LaFarge, Scott O’Dell, the infamous Nasdijj aka Timothy Barrus, who constructed Navajo people and our stories from an outsider’s perspective. "Jesus Cristo," Rosita said, "is like all our gods if you put them together. He is Falling Water and Spider Woman. But he is not cunning like Falling Water, nor is he vengeful like Spider Woman." In doing so [constructing Navajo people our stories from an outsider's perspective], a disservice was done to the Navajos, as it also reinforced old and new stereotypes. Furthermore, Roanhorse’s appropriation, especially as an in-law who married into and lived on the Navajo Nation homeland and as an Indigenous relative, is a betrayal of trust and kinship. We do not want to let such breaches of faith and cultural contract slide any longer. So we write this letter objecting to the book. Are the writers going to speak up about other books and writers in the future? It sure sounds like it to me, and while it makes me nervous for writers, I also welcome the letter because I think it can have a positive impact on writing. During Twitter conversations, someone asked if other Native writers have been challenged for writing stories of a Native people that is not their own. Two people came to mind: Joseph Bruchac, and Tim Tingle. Bruchac's Code Talker: A Novel about the Navajo Marines of World War Two came out in 2004 from Dial Books. There are passages of ceremony in that book. More recently, Tingle wrote a series about the Long Walk. Published by 7th Generation, it featured a teenager named Danny Blackgoat. In the third book, there is a chapter called Grandfather's Healing during which Danny recites a prayer. I've shared the Diné letter in several places because I think what they said is important. Some have responded to the letter (not necessarily to me, specifically) by asking questions like 'who gave the Diné writers authority to write this letter?' As the writers indicated, the Diné Nation does not have a committee that has oversight over this but they are--as citizens of a sovereign nation--defending that sovereignty and acting to safeguard their spiritual beliefs. We could turn that particular question onto a writer and that writer's cultural advisors: who gave them authority to write/endorse the book's contents?! Indeed, who gave me (Debbie Reese) authority to review books, at all? Clearly, some of these conversations go nowhere but other ones can help us with our work. What does the letter mean, for AICL, and for me as a critic and scholar of representations of Indigenous peoples in children's and young adult books? when I use the #OwnVoices tag, I will only use it for a book by a Native writer who is writing of their own nation. And I will take care to identify the nation of the writer who is writing outside their own nation. Joseph Bruchac's newest book, Two Roads, is about a Creek boy. We have not yet reviewed it on AICL but when we do, we'll note that Bruchac is Abenaki. Earlier this week, I saw an announcement that, in 2019, Tim Tingle will have a Choctaw detective book out for middle graders. 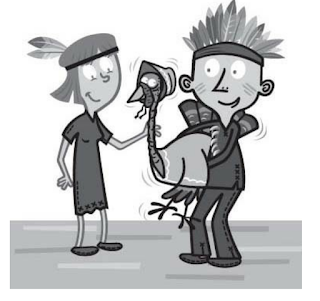 He's Choctaw; the character is Choctaw, so that would be an #OwnVoices book. when I see any references to the spiritual or religious ways of Indigenous people in a not-own-voices book I am reviewing, I will include a note that I cannot speak with authority about that particular content. If there is a note in the book about a sensitivity reader, I will note that information, but also note that there is a continuum of what people think regarding what can and cannot be shared. Roanhorse's Trail of Lightning is a good example of that. She's not Diné, but Diné readers disagree in their determinations of what can and cannot be shared. At this moment, I am most concerned when the content is about religion or spiritual practice. I don't think that other subject matter (like events of the Long Walk) is as problematic but for sure, I'll be paying closer attention than ever before. One thought is this: how to enforce any of this? Well, the fact is--nobody can enforce anything. This is not a question of a body or bodies of people forcing something to be undone. This is a question of ethics and decision making. I think that scholars of Indigenous literature will be citing the Diné letter in the future. I don't know what that will look like. Will they embrace it? Or will they reject it, in parts or in its entirety? What do you think about it? If you work as an editor in a major publishing house, has anyone brought this letter to an editorial meeting? Will you take it to the next one you attend? Have you seen the contents of the letter being discussed as a conference yet? Has it been discussed in your social media networks? If you have any thoughts to share, or, if you have seen things said that you'd like to bring to this post, please submit them in a comment. A few days ago, people started sharing the books that Amazon has listed as "Best Children's Books of 2018." 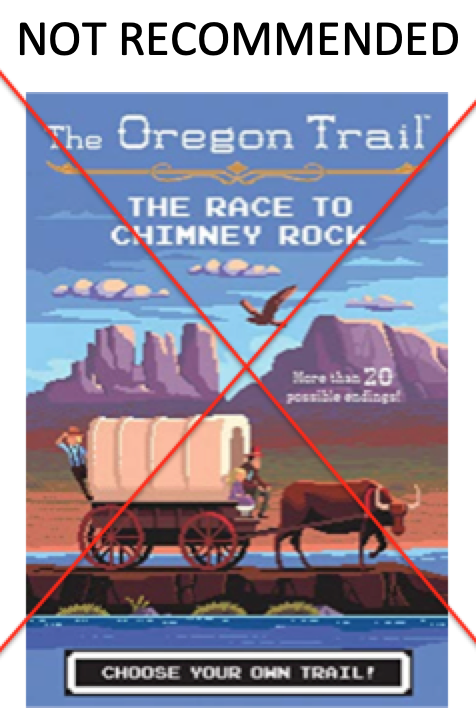 In the ages 6-8 category, Amazon has The Oregon Trail: The Race to Chimney Rock. As you might imagine, it is in that category of books that AICL usually describes as NOT RECOMMENDED. Published on September 4, 2018 by Houghton Mifflin Harcourt, it is book 1 in a 4-book series. The series is like the "Choose Your Own Adventure" books where readers make a decision about what they want to do at a specific point in the story. Instead of an adventure, readers of this series choose their own trail. 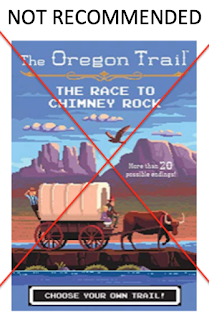 The publisher of The Race to Chimney Rock made a marketing decision that people who liked the Choose Your Own Adventure series and/or those who liked playing the Oregon Trail video game, would buy this series. That Amazon lists it as one of the best books of 2018 tells us that the publisher was right. With this series, it is adding to its profit margin--but miseducating children. Of course, that doesn't matter. What matters more and more in the US is $$. You are loading up your covered wagon to head out to Oregon Territory, where a square mile of free farmland awaits your family. As you and Pa load your covered wagon to head out to Oregon Territory, he tells you about the square mile of free farmland you are going to claim. You had read Section 4 of the Donation Land Act of 1850, and know that land was only available to certain people. You know it was designed to displace even more Native peoples from their homelands, and that to get land, you had to be a "white settler" or "American half-breed Indian." You know the law is wrong and racist. What do you do? If you speak up, turn to page __. If you decide to keep quiet, turn to page __. I don't have an edit or suggestions beyond that, but I wonder what kids would come up with in a class where their teacher helps them map out different choices than the ones in Race to Chimney Rock? The teacher would have to begin by providing students with an in-depth unit about the history of the area that came to be called the Oregon Territory. It would take a lot of preparation, but wouldn't it be interesting to see it, in action? "Before it was called the Oregon Trail, it was known by the Lakota and other tribes as Shell River Road. And before that, it was a trail used by animals, like buffalo. It's an old, old trail." Isn't that terrific? I think Marshall's book is terrific, and I wish publishers would stop putting out books about the gold rushes (there was more than one) and the Oregon Trail! Those books glorify periods of history--and in that glorification, mislead readers about the facts of history. 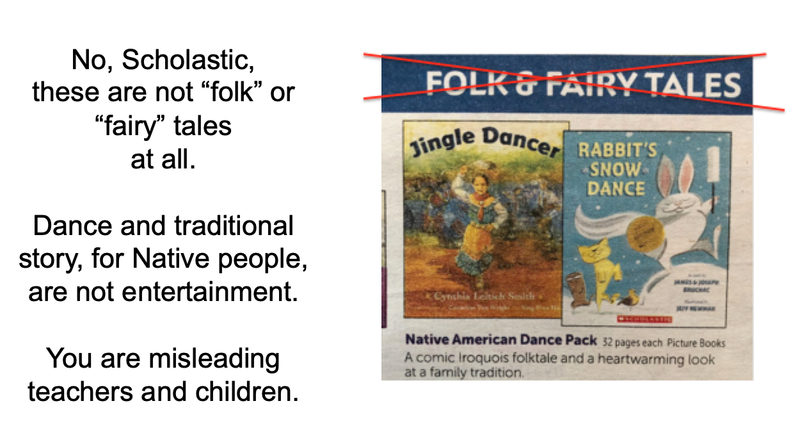 Teachers who use the books, uncritically, are mis-educating their students. To conclude, I do not recommend The Oregon Trail: The Race to Chimney Rock. I've got notes stuck in my copy here and there... there's so much wrong! Avoid it. If you already bought it for your child, see if you can get your money back. 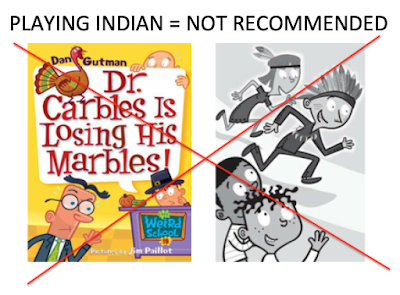 Published by HarperCollins in 2008, Dan Gutman and Jim Paillot's Dr. Carbles is Losing His Marbles! gets a Not Recommended label right away. So we were sitting there, bored out of our minds, when suddenly two American Indians came running down the aisle! They were wearing feathers and head-dresses. They jumped onto the stage, whooping and hollering. But they couldn’t fool us. We knew exactly who they were. “It’s Mrs. Roopy!” yelled my friend Michael, who never ties his shoes. Mrs. Roopy is our librarian. “And Mr. Klutz!” yelled my friend Ryan, who will eat anything, even stuff that isn’t food. Mr. Klutz is our principal, and he has no hair. Mrs. Roopy always dresses up like somebody else. She never admits she’s the librarian. 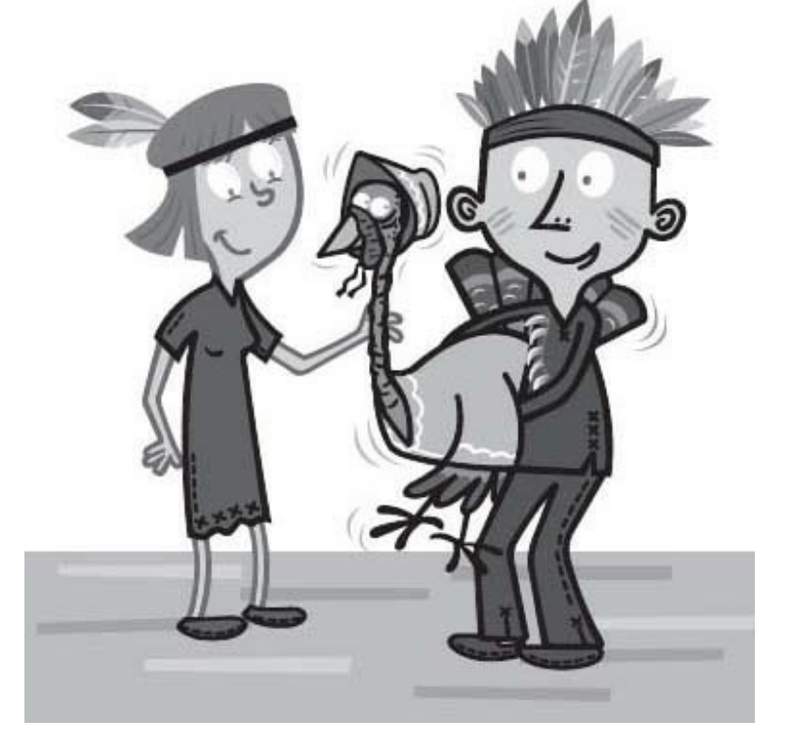 The principal says that if every class makes "a beautiful Thanksgiving display," he will marry the turkey. Everybody cheers, the turkey gets scared, and takes off. Kids freak out. Just then, the school board president, Dr. Carbles, walks in, learns what is going on and fires the principal. There's very little to do with thanksgiving as the story continues. As noted above, Dr. Carbles is Losing His Marbles was published in 2007 by HarperCollins. The first e-book was published in 2008 and in 2015, Scholastic started publishing it, too. There's so much wrong with the opening pages of this book. 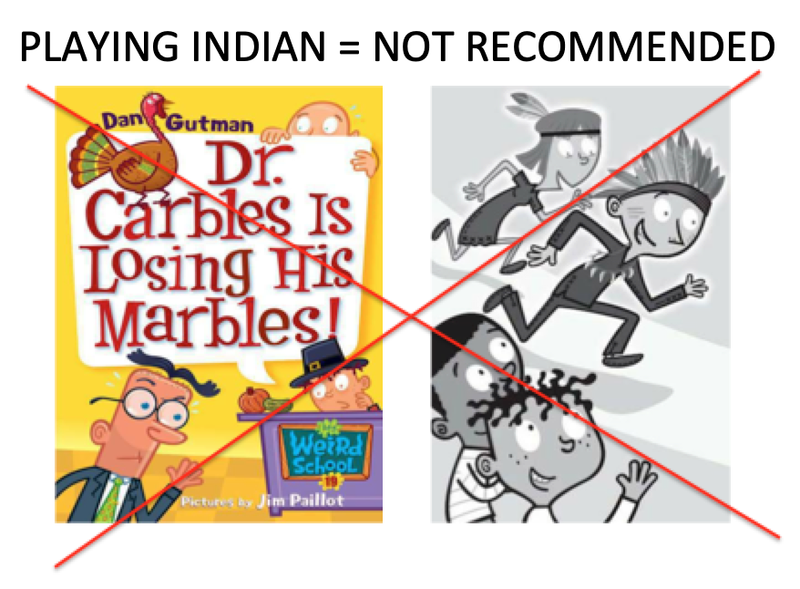 Both, Gutman (with his words) and Paillot (with his illustrations) are giving kids stereotypical, biased, and factually problematic information. They created that content and their editors approved it. Because it part of a series, it doesn't get reviewed closely by the review journals--and because it is a series, librarians purchase the books. Why, Gutman? Why, Paillot? And why, HarperColllins and Scholastic, are you publishing this? At last! A writer incorporates a critical take on LITTLE HOUSE ON THE PRAIRIE! The writer? Emma Donoghue. That's a long title for a blog post, but that's what I want people to see right now. Sumac Lottery is nine years old and the self-proclaimed "good girl" of her (VERY) large, (EXTREMELY) unruly family. And what a family the Lotterys are: four parents, children both adopted and biological, and a menagerie of pets, all living and learning together in a sprawling house called Camelottery. Then one day, the news breaks that one of their grandfathers is suffering from dementia and will be coming to live with them. And not just any grandfather; the long dormant "Grumps," who fell out with his son so long ago that he hasn't been part of any of their lives. Suddenly, everything changes. Sumac has to give up her room to make the newcomer feel at home. She tries to be nice, but prickly Grumps's clearly disapproves of how the Lotterys live: whole grains, strange vegetables, rescue pets, a multicultural household... He's worse than just tough to get along with -- Grumps has got to go! But can Sumac help him find a home where he belongs? Once upon a time, a man from Delhi and a man from Yukon fell in love, and so did a woman from Jamaica and a Mohawk woman. The two couples became best friends and had a baby together. When they won the lottery, they gave up their jobs and found a big old house where their family could learn and grow... and grow some more. She's trying to find that wonderful Christmas scene in Little House on the Prairie, but she keeps coming across racist remarks about savages, so she gives up. It is terrific to see that characterization described as racist. I wonder how readers will respond to it? Will they notice? Some will, for sure. Dr. Bittner did; I care enough to write a post about it, and I bet Native kids will notice it, too. If you have any thoughts on it or see people commenting on it, let me know!